Enable GCNI to gather ideas from Italian regional communities and companies on how the GCNI Foundation can best support Italian companies willing to achieve sustainable development goals. In partnership with Genius Loci. Gerardo de Luzenberger and his company Genius Loci had been commissioned to design an innovative process for the 2016 GCNI Annual forum. Genius Loci and Stormz developed an integrated innovative design for the forum based on a combination of traditional and digital tools, and to the co-facilitation of the whole Forum. A 3-hour session during which participants were able to raise issues linking sustainability to their own day-to-day activities. Once they had picked challenges they wanted to tackle, they split into self-managed groups to discuss them further. For instance, some of them worked on “sustainable tourism: what does it mean?”, while others were debating on the issue of “circular economy: challenge or rip-off?”. Participants could come and go between discussions so iPads were freely available. Participants started by taking notes on paper and they later used Stormz in order to gather the key takeaways of the discussions, including: the issue at hand, what they specifically discussed, their suggestions and the name of the person who posted the issue (one open step). We concluded the session with our Insight Cloud in order to highlight what the participants would “bring back home” after the forum. Discover how our Insight Cloud works. Taking note on paper let participants make drawings and sketches of their ideas and using Stormz enabled participants to digitalize these notes and have a clear feedback immediately at the end of the Open Space Technology session. After having discussed the issues faced by Italian companies during the morning forum, the afternoon workshop was dedicated to finding ideas on how the GCNI foundation could support these Italian companies to reach their sustainable development goals. First, participants had time to read the reports from the morning session so they could get a firm grasp on all the issues that were raised and the solutions that had been suggested. Step 2 – The most important issues for the GCNI Foundation Participants could then discuss what they read and suggest what they thought were the most important issues raising for the GCNI Foundation from the morning discussions. The results of this step where shown in a word cloud. Participants were asked what the foundation should stop/keep/start doing to help companies in achieving their goals. This technique is incredibly useful to make people think about the reality of the current situation: while we often think about what we should do, we rarely wonder about what we should stop doing. Try your own stop/keep/start! Step 3 – Prioritizing Participants voted to choose the proposals they thought were the most relevant. Complete reports of the morning Open Space session. And all the ideas of actions to stop/keep/start for the foundation and the participants’ priorities regarding them. After the OST session of the morning, the full reports were made immediately available to all participants in a clean .pdf format so they could go back to work with a new insight. Thanks to the Insight Cloud feature, facilitators had the opportunity to have an extensive overview of the most recurrent contributions and “sense” what came out of the discussions. The vote system was also particularly useful in this session to prioritize in a very short time. Check out our blog post about the vote system. Mixing the use of traditional meeting tools like flipcharts and ipads enabled participants to make sketches which they photographed and directly uploaded unto Stormz. No loss of valuable material and ideas! 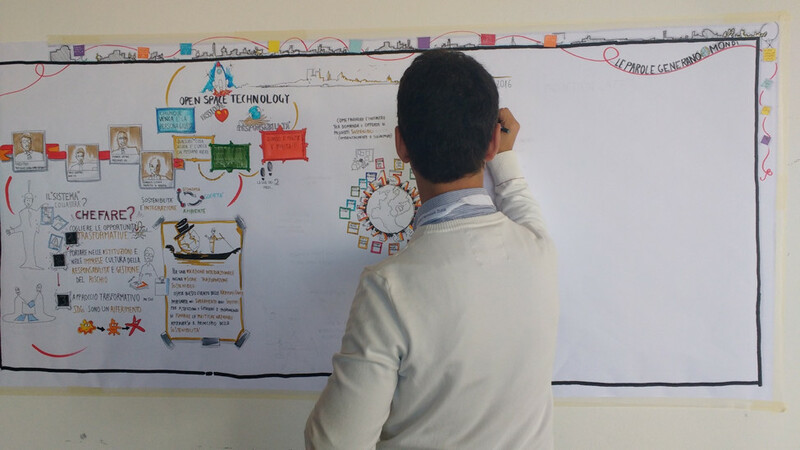 The visual facilitation was a good way to represent the atmosphere of the session and the chronology of the event. Afternoon: an action planning session starting from the results of the open space with the members of the GCNI Foundation. Facilitators: Roxane from Stormz, Gerardo de Luzenberger, a visual facilitator and a support-team of three people from Genius Loci.